None so far! I have trouble staying awake until midnight :) I'll watch the New Year arrive in Paris, much earlier! 2. How tall are you? I am 5'4" tall. Would you consider crème brûlée a pudding? If so, that's my favorite. If not, vanilla. My room I use as a studio. Painting, printing and blogging. All good! My hair? No. Eyes? No. Probably a 1 inch space at the middle of my back. But I'm not positive.....I can't see it. Your answers are hilarious! visiting from the blog hop! Please stop by and say hi at mine! You have a new follower! Stopping by from Meet Me on Monday!! Have a great day! I love your answers, especially Q#5. LOL, same here! I'm following your blog on Google Connect. Would you consider following me? I love creme brulee! There seem to be a few of us 5'4" out there! Thanks for joining the hop!! 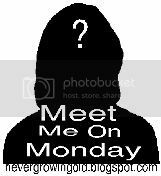 Please add the Meet Meet Me On Monday button to your post! Those are some great answers!! Hi Java - lots of fun! Thanks for the hop. I love your answer to #5. Funny!! Thanks for stopping by! I'm following back! Thanks for stopping by my blog earlier! Love your answers, especially to question 5. Have a great week & Happy New Year!